What is SaaS Business Intelligence (BI)? Subscription pricing for cloud-hosted BI tools like dashboards. SaaS BI is a cloud-hosted application that uses recurring or subscription-based pricing to deliver BI tools, like dashboards, to enterprises. The term SaaS BI combines two acronyms: SaaS (Software-as-a-Service) and BI (Business Intelligence). Like SaaS offerings in other categories, SaaS BI is often touted as having key benefits over "on-premise" software deployments such as lower costs, less complex and being easier to deploy. SaaS BI offers one significant benefit over on-premise applications: they are much easier and more cost-efficient adding users to the application, whether you are adding 1 user or 1000 users. For example, adding a single user to a SaaS dashboard means paying for an additional "seat" and supplying that user with credentials for accessing the dashboard using a web browser. On the other hand, adding a user to an on-premise BI application requires installing the software on the local computer, potentially upgrading the computer, and then synching the application with other computers on the network. This isn't just a disadvantage, it's a barrier that stalls or stops software deployments in their tracks. SaaS BI also offers the advantage of accessibility. Unlike on-premise applications, which may be locked behind a firewall, SaaS applications can be accessed on any device with an internet connection. Not only is it easier to view information, such as data dashboards, with a SaaS BI application, it also makes the application easier to deploy since it only requires a web-browser (no upgrades or software installation needed). SaaS BI offerings include multiple types of applications; however, SaaS dashboards may be the ideal expression of BI in the cloud. 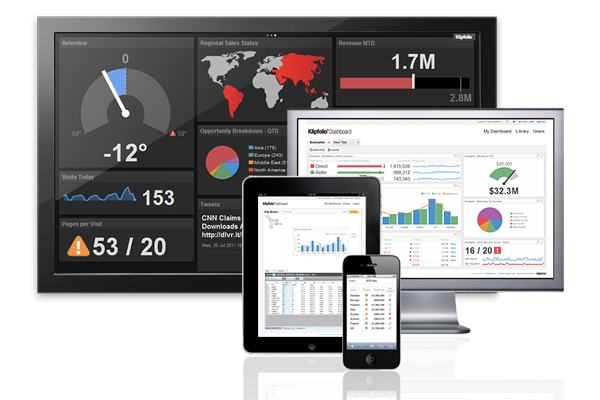 The reasons for this is that dashboards summarize and consolidate key facts about the business for easy consumption. By deploying a SaaS dashboard, enterprises can reach a large audience quickly and effectively encourage users to view business-critical information during the course of normal web-browsing.